I have had several requests from different people for Kitchen Angels, so I put my imagination to work and here they are. 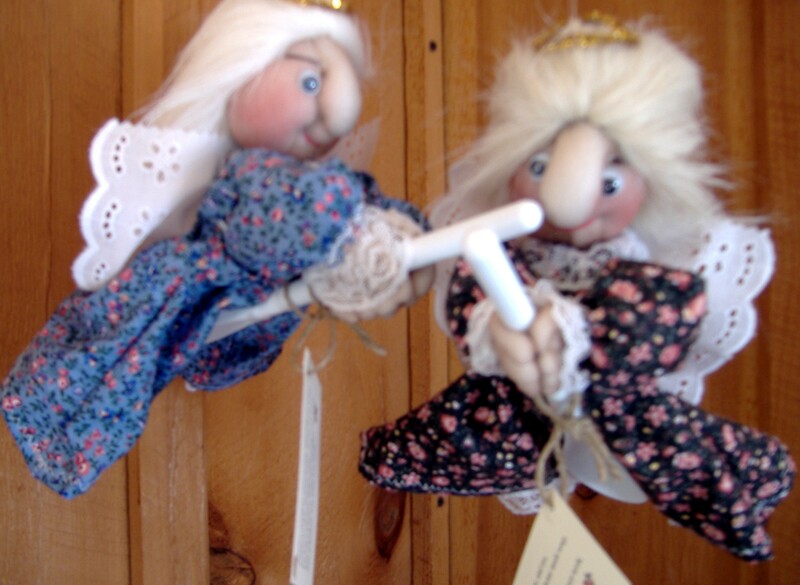 Kitchen Angels are an alternative to my Kitchen Witches and also make great conversaton pieces as well as gifts. Each angel rests a spoon, broom, or whisk she is riding and is about 12 inches long, has long styled hair, and wears a halo. She has lovely white eyelet wings that look like they might start flapping any moment. Each Angel will have her own special poem hanging off from her spoon, broom, or mop. Each Angel looks like she is just gliding about your kitchen as you work along. Like my Kitchen Witches and other crafts I make, each Kitchen Angel is customed designed to your preference of colors. Price for each is $22.95 plus $12.00 for shipping and tax . Orders in the USA only. Red calico, blue calico, yellow calico, green calico, black calico, or white. White, brown, blonde, red (carrot color), grey, or black.